Sensory input provides the signals used by the brain when listeners understand speech and participate in social activities with other people in a range of everyday situations. When sensory inputs are diminished, there can be short-term consequences to brain functioning, and long-term deprivation can affect brain neuroplasticity. 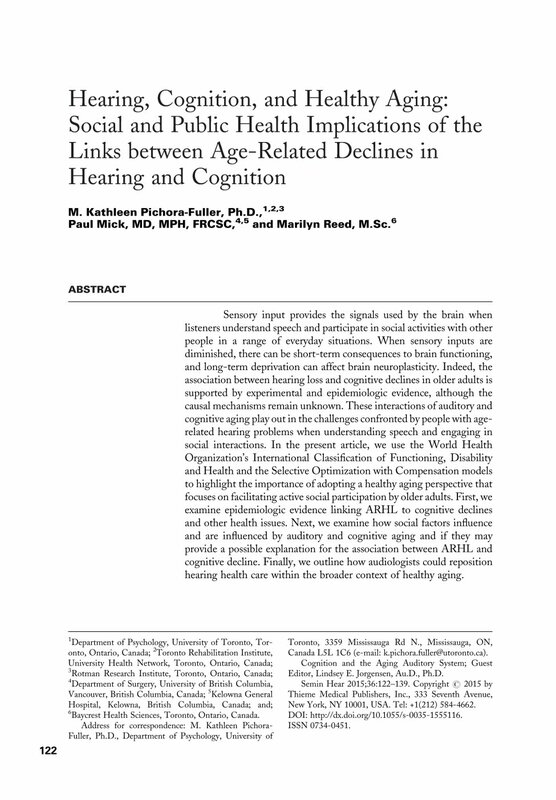 Indeed, the association between hearing loss and cognitive declines in older adults is supported by experimental and epidemiologic evidence, although the causal mechanisms remain unknown. These interactions of auditory and cognitive aging play out in the challenges confronted by people with age-related hearing problems when understanding speech and engaging in social interactions. In the present article, we use the World Health Organization's International Classification of Functioning, Disability and Health and the Selective Optimization with Compensation models to highlight the importance of adopting a healthy aging perspective that focuses on facilitating active social participation by older adults. First, we examine epidemiologic evidence linking ARHL to cognitive declines and other health issues. Next, we examine how social factors influence and are influenced by auditory and cognitive aging and if they may provide a possible explanation for the association between ARHL and cognitive decline. Finally, we outline how audiologists could reposition hearing health care within the broader context of healthy aging.